At the very boundaries of human endeavour, survival hangs from one thread. Access to fuel has defined every significant expedition, from Roald Amundsen's search for the Northwest Passage in 1903 to SpaceX’s trip to the International Space Station earlier this month. Without energy, all would be lost. As we seek to learn more about Earth’s remotest regions – often to understand the effects of our actions on the natural world – the need for fuel has not abated. And while there’s an irony in using oil to research climate change, renewable energy is growing its influence at the very edge of the Earth - and beyond. Sue Roaf, Emeritus Prof of Architectural Engineering at Scottish Renewables member Heriot Watt University, is one of those leading the charge. Last month, in the shadow of the Collins Bay Glacier on King George Island, Antarctica, Sue and Portuguese colleagues Manuel Guedes and Joao Pinelo built the Polar Lodge. 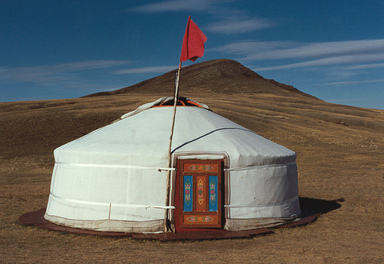 Based on a Mongolian yurt, it’s designed to stand up for twelve freezing months in Antarctica, in winds of up to 200mph. And it’s using solar power. “My Portuguese colleagues, Manuel Guedes and Joao Pinelo, and I had to upgrade both our design and energy ideas for such an extreme climate. “In the end we powered our four-metre diameter tent only with six really efficient Velux solar lights, which we hang from the walls of the adjacent Chilean research refuge to charge. Sue’s trip to Antarctica shone a light onto more than that easily-overcome challenge, though. “While we were staying at the Chilean base Escudero, as part of the Portuguese ProPolar team, we had time to look at their energy supply challenges and those of the adjacent Russian (Bellinghausen) and Uruguayan (Artegas) stations. “Looking out over the Escudero and Bellinghausen bases it was difficult to see any trace of wind generators or solar panels being used, except for one or two small PV panels powering remote installations. “Everywhere there is evidence of the huge amounts of fossil fuel storage needed to keep the bases going over the summer when they are fully occupied, and to a lesser extent the winter months when a skeleton staff remains. There is much hope among polar scientists that renewables could spell the answer to these challenges. Belgium’s Princess Elisabeth Antarctica research station, located in Queen Maud Land, is a zero-emission research station which runs entirely on solar and wind power, and is home to 16 scientists. The International Polar Foundation team which built this remarkable structure took advantage of the 24-hour sunshine of the Antarctic summer months and wind gusting from the plateau to provide the station's primary source of power, working with Schneider Electric and GDF Suez to develop a smart grid that is “three times more efficient than any existing conventional energy network”. “Many of the research teams are only in Antarctica in the summer, when the sun shines, so solar does make sense, even if it needs real skill to get the panel angles and fixings right to withstand the extreme winds there. “It must only be a matter of time before all stations are fitted with efficient micro-grids including solar and wind generation. The robustness, simplicity and light weight of renewable energy tech make solar, small wind and more the perfect choice for remote regions, as Scotland’s islands are showing already. And as humanity pushes the boundaries of its footprint in the world’s most extreme environments, it’s right that the energy choices of those living there are part of the solution, not the problem. Our events programme is packed with stories like these - get the dates in your diary now.